The threat of a contaminated water pipe can exist when the Legionella bacteria finds a breeding ground within your water piping system. Still water or water with the “wrong” temperatures are only a few examples where Legionella outbreaks stem from. Other examples are ghost pipes (pipes that are not really used) or water taps and showers that are seldom used. When endusers are worried about their level of Legionella, and they have a water test conducted, always bear in mind that a water test is just a test of the water quality at that certain point in time; the quality of the water may differ on a daily basis. And although in this application note we mainly discuss new buildings, the issue of Legionella at older buildings is also alarming; in many buildings, flats, hospitals or public buildings, the water piping systems are dated. The Legionella bacteria live here mainly in those piping systems with still water and in some cases result in a Legionella outbreak. Legionella shows an optimum growth rate between 86°F - 104°F and flourish in stagnant water. In an enclosed water system, pipes that have not been flushed can produce a biofilm layer over time which is advantageous to Legionella. This biofilm can serve as a nutrient supply for the microorganism. It is therefore essential to maintain good water quality, in an environment like a cooling tower, in order to ultimately reduce the potential breeding grounds and nutrient supply for Legionella and other bacteria. Legionella can cause infections like Legionnaires disease and Pontiac fever if large numbers of the microorganism are either inhaled or aspired into the body. Legionnaires disease is caused by a bacterium called Legionella pneumophila. Contaminated water sources and more specifically contaminated water distribution in large buildings such as hotels, hospitals, and schools are prime sources for Legionnaires disease. Other sources include cooling towers, humidifiers, spas, misting machines and hot springs. OMNI Solutions offers immediate water treatment modalities to remediate existing legionella bacteria contamination and preventive UV technologies to stop threats from entering your water systems. Ultraviolet light, at a specific wavelength of 254nm, has been utilized as a disinfection technique since the early 1900’s. It can be described as a physical means of disinfection as it adds nothing to the water besides UV energy. UV light does not alter the smell, taste or odor of water, it simply targets the DNA material of microorganisms present in the water supply and renders them incapable of reproduction. A microorganism unable to replicate cannot breed colonies and therefore cannot infect. This is an extremely rapid process that does not require long periods of contact time as you would expect with disinfectants like chlorine. The UV energy required to inactivate microorganisms is referred to as dose (fluence). Dose is a product of the intensity of the UV light and the amount of time the water is exposed to this energy. Different microorganisms require different levels of dose in order to render them inactive. The nature of cooling towers and recirculation loops present a significant maintenance and health challenge. These warm, dirty and bio-nutrient rich environments harbour the ideal location for fast growth and migration of microorganisms through the ‘loop’. 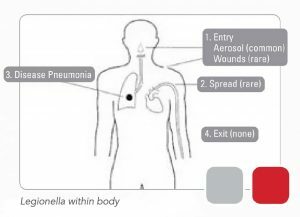 UV light is extremely effective at the inactivation of Legionella at low dose levels. 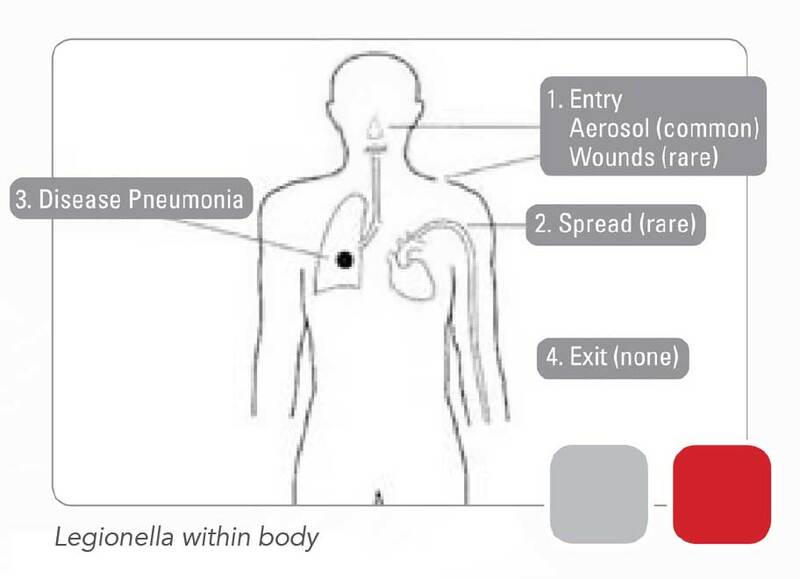 Different species of Legionella do require different dose levels for inactivation, however all of these levels are relatively low and well within the operating parameter of the OMNI UV systems. Our business is based on the manufacturing and distribution of UV-based solutions surrounding the issue of clean and safe drinking water. 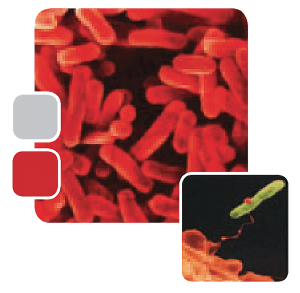 Our products specifically target and eliminate bacteria in your water, such as Legionella through proven product performance. Talk to one of our Water Specialists today to determine the best OMNI product for your specific application need.